Seriously though, please go and check The Bookshop on the Heath for these books first – the links below should be a last resort! If there are others books that I don’t know about, drop me a note in the comments, and I’ll add them to the list. 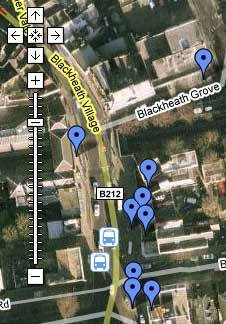 They’re the best source of historical information about Blackheath bar none. There are 2 large volumes – Blackheath Village and Environs Volume 1 covers the village and Blackheath Vale. Volume Two is almost impossible to find cheaply as it is out of print. I found it in Blackheath’s Cancer Research shop for a few pounds, but this was a miraculous discovery – it’s usually £50 or so. There’s also a third volume, called The Heath, which unfortunately I don’t possess (yet). A new addition in 2013 is The Blackheath Seance Parlour by Alan Williams. It’s a great spooky tale about two sisters in Victorian Blackheath, who decide to open a seance parlour. Highly recommended, read my full review here. In terms of books inspired by Blackheath, the one that springs to mind was published a couple of years ago – A Vintage Affair by Isabel Wolff is pretty much exactly how it looks… Easy to read, fun, and primarily aimed at a female audience. Here’s my review of it from 2009. Going back into time, and Nathaniel Hawthorne wrote a series of sketches about living as an American in England. Called Our Old Home, it contains reminiscences of his time living in Blackheath. His novel The Scarlet Letter (although not about Blackheath) was the inspiration for the (very funny) movie Easy A from last year. Charles Dickens makes passing mention of Blackheath in Our Mutual Friend, and also in David Copperfield, as mentioned previously on the blog. The Most Intimate Place by Rosemary Furber is a thriller set in Blackheath. Looks great, and gets excellent reviews. I might try it over Christmas! Thanks to @helstweets for suggesting it. The Dead of Summer by Camilla Way sounds like a chilling read, set in the tunnels beneath Greenwich Park – see the Phantom’s review from 2007. The Twelve Days of Christmas by Stuart Weatherby – set mostly in Blackheath, it’s a nice (fictional) read by a local author. A couple of duffers go to war by Geoffrey Lee Williams and his twin Alan relates life in Blackheath during the war from a child’s point of view. The Blackheath Poisonings is rather fun, though I’m still wading through the TV series due to it only being available in US format. Just looked at ‘Our Old Home…’ on Amazon, the latest edition at £9.99 looks a bargain compared with the prices of some of the ‘used’ editions from a couple of years ago. maybe it’s an investment?! Sorry to be self-advertising but people keep asking and asking. My latest book (co-authored with Philip Cooper) on Montague House and the Pagoda, Eliot Vale, is now in all the best bokshops, as they say. Hope Bugle readers will enjoy it. Paragon book should be on the bookstalls by March. Very big and a hefty cover price but good value, I like to think.